Male. Taken at Chimney Meadows, Oxon., on September 27th 2018. Female f. helice. Taken at Paklenica Nat Park, Croatia, on June 8th 2017. A fast-flying, bright yellow butterfly, the Clouded Yellow can sometimes be seen in large numbers but in other years is very rare. This is because numbers in the British Isles depend on migrants arriving from Europe. 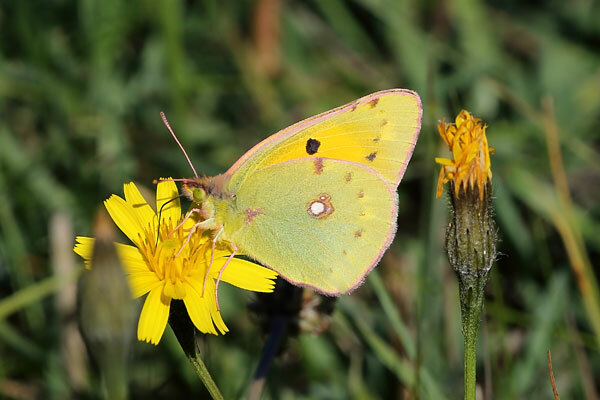 Clouded Yellows are most common in southern England, but can be seen as far north as Scotland. Adults usually arrive in May and June. These early immigrants may breed and give rise to one or two further generations. The larval foodplants are leguminous plants, particularly Lucerne, Alfalfa, clovers and trefoils. Adults feed on Thistles and other nectar-rich grassland flowers. 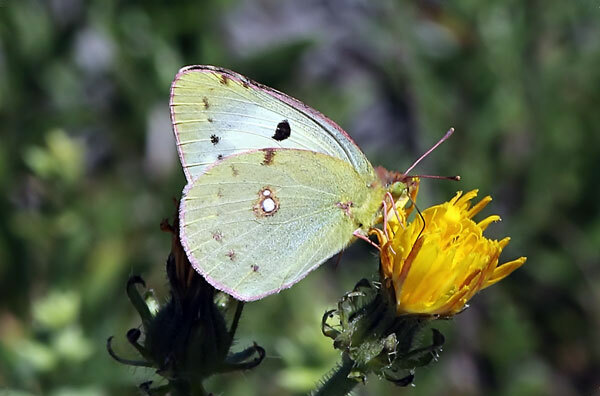 Clouded Yellows fly very rapidly, but will pause to feed on flowers.